The following is from Homecooking.About.com: Clam Storage and Selection (1). 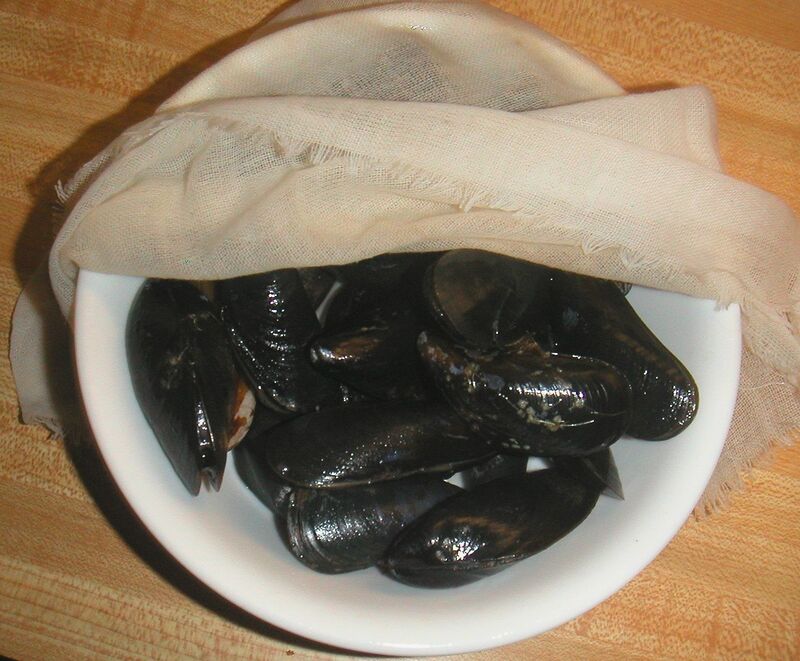 Live clams & mussels still in the shell should be stored in the refrigerator in a dampened cotton bag or in a bowl covered with a wet cloth. Never store on ice or in sealed plastic container, nor submerged in water, as they will die from lack of oxygen and their own waste. While they are best used within 24 hours, they will last a few days in the refrigerator if stored properly. Discard any that are dead or have broken shells. To test for life: Tap the shell of any one that has opened; if it does not immediately close, or if you can easily open/close the shell yourself, it is dead. Similarly, when steaming them, their shells will open as they die; tap the shell to see if it closes — if it does, it is not yet dead and needs to be steamed a bit longer. Shucked clams should be plump and have a fresh smell, and seem heavy for their size. Their juice should be clear with no shell fragments. Discard any with the odor of ammonia. This takes such a short amount of time, and helps to clean sand and grit from inside the shell before cooking. Inspect and clean mussels or clams, tossing any that are dead or damaged. See “Test for Life” above in the storage section. Place good ones in a bowl; pour salted water over and brine 15 minutes in the refrigerator. Transfer to a strainer over the sink, and rinse well with cold water. Grasp the ‘beard’ between your thumb and forefinger and pull it downwards towards the hinged-end of the mussel shell. Pull firmly until it comes out and discard. If you have trouble gripping the beard with just your fingers, a dry paper towel can help. 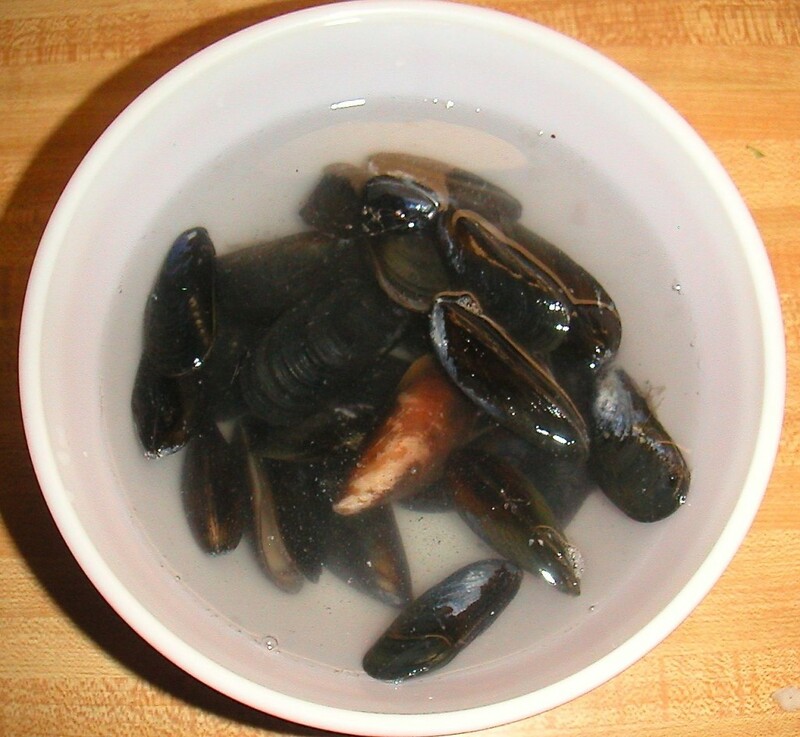 One method is to steam the clams/mussels until they are dead (see below). They can then easily be removed from the shell. First put them in freezer for 5 minutes, to loosen their hold on the shell. Then work over and empty bowl to collect any juices. Hold shell in your hand with the things toward your palm. Insert a thin, dull knife (never a sharp kitchen knife) between the top and bottom shells. Work the knife around, so you can cut through the things. Open the shell slide the knife between the clam and the top shell. Detach the clam by sliding the knife between it and the bottom shell. These instructions are from Timeless Gourmet (2), which has excellent photos, and WikiHow (3). 1. Inspect clams/mussels and remove those that are dead or have broken shells (see above). At this point you can rinse well in cold water; or you can brine them first and then rinse (to encourage them to give up any sand and grit). See above for brining instructions. 2. You need about 1/4″ (or more) of simmering liquid in the bottom of the cooking pan. If steaming in water, bring the water to a boil, then simmer. If steaming in a sauce, it should have been at a boil during the making, then reduced to simmer. 3. 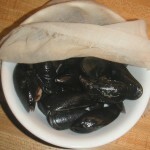 Add rinsed clams/mussels to simmering pot; cover and cook 5 – 10 minutes, until the shells have opened up. Discard any whose shells have not opened. 4. If you steamed them in water, save this clam broth for dipping the cooked clams (to remove sand and grit, which sinks to the bottom of the broth bowl). If you steamed them in a sauce, the sauce will pick up the flavor of the clam broth, but the sand has no where to go but into the sauce. The watery the sauce, the better, as the sand will sink to the bottom where you can avoid it. This entry was posted in Alcohol, Citrus, Cold storage, Herbs, Onion family, Shellfish, Steamed, Vine veggies. Bookmark the permalink.